Helsinki, the capital city of Finland is mostly dark in the middle of winter. Like other Arctic countries, Finland is dark for most of each day in winter and light throughout the midsummer nights. This is because of its northerly location. To understand more about Helsinki, you must start your journey at the Mannerheim Museum; an excellent tour of this museum gives a whole new perspective on the history of Europe, Finland, and Helsinki. The Fortress of Suomenlinna is a rocky island near Helsinki that is well served by the many boat transports per day. Here, you can truly relax and forget the hustle and bustle of the busy capital. Everywhere there are old buildings, cannons, ruins, ramparts, and other war relics overlooking the great Baltic Sea. In addition, there is a lovely beach and there are plenty of tents for a snack or drink to do. The city has a tendency to get a bit freezing in the winter season, so the significant peak season is amid the hot summer months. Amid the summer season, the low temperature normally drift around 60° Celsius and high temperatures typically don't move over eighty or eight five degrees, making Helsinki an ideal holiday choice for guests from spots which get hot amid the late spring months. As far as when is the best time to set out to Helsinki other than identified with climate concerns, travel can actually be done anytime. Based on travel statistics to the city, the months of June through September is the busiest time of the year all the way up to August, which is stamped with a great variety of national events and celebrations. It is also during this time when the city encounters just around four hours of darkness every night giving comfort to travelers to appreciate more time being outdoors, to see the sun and go around to explore the interesting attractions of the city. Here are the best things to do on the chilly and cold city of Helsinki. It takes only a moment to get there by ferry and voila you arrive in a scenic gem with historic buildings, where the chirping of the birds is the only sound you will hear and the waves of the ocean. It is really an experience to wander around at the many small paths and see the old structures, forts, big guns, etc. The Fortress of Suomenlinna is a cozy place and as a tourist you will feel that you have seen a little piece of Finland's nature and walk through an important part of their history. Suomenlinna is worth a visit at least half a day and can be visited at different levels. To see and understand it more clearly, the best way is to take the blue trail. You can see the massive presence of restaurants, shops, and hordes of visitors being lead by their guides along the main route. The trail covers what to explore around the island and the coast. It starts with a walk along the cliffs with breathtaking views of the Baltic Sea and a visit to the historical museum of Suomenlinna to learn more about its significant role in Helsinki’s history. If time permits, you can also take a dip in the sea together with the Finnish and enjoy the view from the rocks; it's wonderful, relaxing, and almost spiritual. Finland's history in the late 19th century to the mid 20th century is focused on a historically interesting figure; Carl Gustaf Emil Mannerheim. The Mannerheim Museum in the embassy district of Helsinki offers the opportunity to learn more about this person. It is located in Mannerheim's former villa and is now owned by a foundation that bears his name. The staff provides a portion of the entrance fee to students who receive a scholarship through this foundation. Before you can tour the museum, there are guides available for hire who knows many languages (Finnish, Swedish, Russian and English) to help other foreigners who speak a different language understand the museum better. In general, the museum is very concerned about orderliness and cleanliness: You have to wear shoes together with slipping into waiting plastic slippers in order not to damage the museum floor. Also, photos are not allowed. In the small museum shop there are books and postcards. Most rooms are not arranged well and it is presented like how Mannherheim left after his death in 1951. They provide a glimpse of Mannerheim's successful career from the officer and adventurers to the convening of the Head of State in Finland's darkest hours during World War II. There are lots of special pieces discussed during the tour, even the sensitive issues such as the temporary cooperation of Mannerheim with Nazi Germany that is treated objectively and well explained. (Finland ran a diplomatic tightrope in the Second World War, but was characterized despite loss of land to the Soviet Union, in contrast to the Baltic States who chose to preserve their independence). With 10 Euro entrance, the museum is not exactly cheap for a Finnish Museum but it is within average. If you want to know who Mannerheim is and have an insight into Finnish history from turn of the century until the second world war this museum is highly recommended. The Kamppi Chapel of Silence is located in a square in the center of Helsinki. It looks nice from the outside and all made of wood. It does not look so much like a chapel, but more like a work of art. If you go inside you will be caught by surprise by the tranquility it exudes. The staff says it has something to do with the Scandinavian style and simplicity in furnishing. It can be accessed via a glass corridor. At the entrance you will be welcomed by a Lutheran priest and a social worker for a brief tour of the chapel. The ovoid shape, designed by the study K2s Architects, is constituted by boards of alder oiled and designed in all solid wood. It is a remarkable example of contemporary sacred architecture and a must see if you go to Helsinki. Admission is free and the short tour of the entire chapel can be done within ten minutes, but they are enough to appreciate this rare work of modern art designed and positioned in the central square to allow those who walk around the area to pause and take a look inside, observe silence, spend time for meditation and prayer even while outside there's noise and an intense swarm of people that are mainly travelers who are eager to know every interesting corner of Helsinki. The Esplanade is a charming tree-lined avenue that runs through the heart of Helsinki with a paved walking path leading to the market in the harbor. The avenue is lined with nice shops, cafes, and quaint flower boxes placed at the center of the avenue. This place looks more radiant in spring when the lush green covers one end of the road to the other. At night, this is where street artists perform the popular cheer walk. It has lots of green spaces where you can relax on benches or sit directly on the grass. For one reason or another, all residents or tourists go to the Esplanade in Helsinki. Maybe just for a walk, or get an ice cream, or attend one of the many talent shows that take place on outdoor stages. It is a lovely walk in the heart of the city, which links the old part of Helsinki by the sea. The two side streets are full of shops, bars and community centers, spanning a central area of greenery and flowers, fountains, monuments and gazebos built in Central European style. It provides a pleasant and relaxing walk that represents the meeting place of the city where it is easy to find artists and music with spaces dedicated to those who want to perform, in particular young bands. The outlet of the Esplanade opens onto the market square and the harbor from where the boats depart every hour for the tour of the islands from the sea front for a vision of the whole city and its suburbs. From the outside, the Rock Church (Temppeliaukio Kirkko) has its own charm, but upon entrance it becomes the wonder of a building you'd expect to see in the jungle and certainly not in the center of a city. The Rock Church is a popular place for tourists. It has lots of souvenir shops nearby, and stands across a busy residential state. The church is open to the public between 10:00 am up to 3:00 pm. It is a modern building, where famous concerts are also held. It is surrounded by nature and if you enter while there is a holy service, you will be in awe of the piano music that plays in the background. It is a beautiful church where a pleasant atmosphere hangs despite the many and endless stream of visitors. The chapel is made out of a huge rock with a separate roof. The church is a quiet spot in the middle of a residential area. Admission is free so don’t hesitate to drop by and visit when in the city of Helsinki. The Seurasaari Island is a bit far from the city center but it is quiet and peaceful. It is great to visit because there are lots of activities to do aside from sightseeing. In this park, tame squirrels are everywhere and come to you freely. It's a treat! The ideal time to visit this park which is accessible by taking bus number 24 is from the months of June to August. It is a wonderful nature reserve and an open air museum where you can visit homes and rebuilt villages that is surrounded by clear waters. Be sure to explore, take lots of pictures, and eat wild strawberries. It is a small island situated about 15 minutes by bus from the center, and you can also go walking or even running if you come from the beach and the Hietaniemi Cemetery. The island is absolutely beautiful with unique scenery and places to make your own barbecue and have a picnic. It is advisable to bring a few beers and some sausages to do there and enjoy the scenery. It has a view of the typical old houses and buildings and is like stepping back in time, it is amazing, well worth going and it won’t take 20 minutes or so by bus from the city. The Uspenski Cathedral (Uspenskin Katedraali) is located right next to the Esplanade of the harbor and the Bridge of Helsinki. Although it is a typical Orthodox cathedral, both the exterior and interior are beautiful and striking. The cathedral may look smaller than other Russian Orthodox cathedrals but nonetheless it is very symbolic of the faith and frequented by travelers and faithful pilgrims. The orthodox cathedral stands monumentally atop a hill. It is built of red brick, like the other Baltic countries, with typical onion-shaped domes; this one comes in green and gold. However simple it looks, it is imbued with the magical atmosphere of the Orthodox Churches and still a must see when in Helsinki. The Lutheran Cathedral is a majestic building that crowns all the monuments surrounding the Senate Square. Climbing the stairs will allow you to see the square from another perspective. The entrance is on the left side of the church. Inside, it is very simple and tightly focused to the main altar, lots of white, and a picture of Luther in a niche at the pillar. The church is situated on a hilltop, and is therefore seen from many angles, including when you sail into the harbor of the marketplace. It is one of the most photographed places in the city. The Protestant church that was built since 1852 is bereft of any ostentations but it is just beautiful and imposing from all corners, both during the day and at night with the lights on. The Senate Square (Senaatintori) a tourist spot that gives a robust identity to the capital of Finland. It is meeting place for tourists and where buses leave for the guided city tours. Cafes, restaurants and souvenir shops, abound in this nice place that is located right in front of the Lutheran Cathedral. It's a nice square with a few monuments in the middle and a lot of people who hang out around the square or take pictures. At the center there is a monument dedicated to Alexander Nikolaev surrounded by beautifully arranged flowers and benches. The Square is closely linked with the history of Russia and some of the street names carry a Russian translation. The Natural History Museum (Luonnontieteellinen Museo) has a great collection of artifacts that represent the nature of Finland and around the world. It has state of the art installations made with such quality that exhibits these look into the world of wildlife in almost life-like setting. If you have kids, be sure to bring them to this educational museum, they will surely enjoy the stuffed animals and the night African Safari theme of the exhibit. It is absolutely worth a visit to see this museum that seems made for children but also fascinates adults. You will be amazed in the midst of the reconstructions of natural landscapes and animals replicated with precision and skill. The museum is small but very well organized. Entrance costs about 10 euro and includes an audio guide that is very useful for those who do not speak Finnish or Swedish. In addition to the sections on the skeletons of prehistoric animals, there is an entire section devoted to the typical flora and fauna of Finland. Allocated in a beautiful stone building that echoes the forms of an old castle with a staircase entrance guarded by the statue of a bear, the National Museum of Finland (Suomen Kansallismuseo) is worth seeing in Helsinki City. It is not very large (one hour visit is enough) but very well laid out, with various sections ranging from prehistoric times until recent history. Very particular is the section on the various decades since World War II and to follow are the historic events that happened from the 50’s, 60’s, 70’s and 80’s, showing the evolution of lifestyles complete with objects of documentation and with interactive panels which evoke memories and wonder. 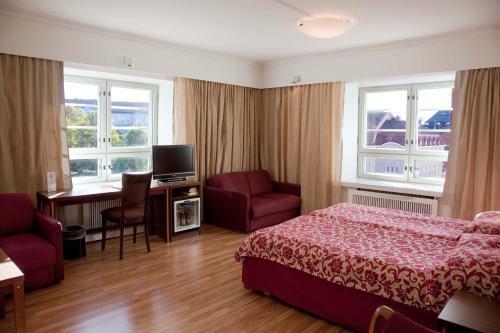 It is not hard to miss and located about a hundred meters away from the city central bus station. Helsinki is a wonderful experience to see, feel, and understand. There are lots of historical places that deeply signifies how much they value their past and love for their country. The tour of the old cathedrals, open-air museums, recreational parks, and old fortress are not only amusing, but you are bound to learn so many lessons about a nation that is heavily influenced by its two powerful neighbors, Russia and Sweden. Another good thing about Helsinki, almost all of the top tourist sites are free which is a big bonus for travelers who usually embark with their journey on a tight budget.